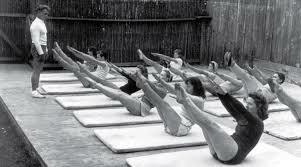 Joseph Pilates the founder of Pilates was born in Germany but moved to England before the first world war. He was a circus performer and a boxer. He has various illness throughout his childhood which made him more determined to overcome these with his fitness. During the first world war, he was interned and during this this time developed his physical fitness regime. Working as an orderly in a hospital he helped patients who couldn’t walk, by supporting their limbs with springs attached to the bed. This was the start of one of his pieces of equipment – the Cadillac. Most people have come across Matwork Pilates classes, which are provably the most popular form of Pilates classes held. Pilates has developed a lot since Joseph Pilates created his original 34 moves. These moves then the classical still taught in the original order as is often referred too as Classical Pilates. Joseph Pilates believed that taught in this order and done correctly then this could be achieved. But Pilates has changed and been modified to enable all abilities, fitness levels and ages to achieve the benefits that Joseph Pilates sought. The variations and modifications that are now taught mean that even with injury all can participate. Although we all teach differently the main purpose and benefits that Joseph Pilates intended are still at the heart of what we do. As clients become familiar and competent with the exercises then the classical versions can be attempted. Overall Pilates done daily/regularly can still have all the benefits the original benefits Joseph Pilates sought. This week in the Studio 44 Pilates (August 2018) membership library of 10 minute online Pilates I go through the first part of our 10 minute 34 moves video. I take you through the Pilates moves giving you variations so that you can experience the original order that Joseph Pilates created. Currently there is 7 Day Free trial, why not give it a go?